Periodically check the ADHP page on our website: www.dentalboard.org for updates and additional class information. You will also find the Prophy count sheet here; this is a 2-sided sheet. Make additional copies throughout the year. The ADHP Videos will be handed out at the first session. The application information for the 2019-2020 ADHP sessions is listed below. The application deadline is APRIL 30th. After May 30th, the Reading Assignments and Classroom materials information will be provided by email and/or posted below. It is your responsibility to periodically check the website for any new updates and/or assignments, throughout the year. This is a 2 page document that must be printed as a double-sided document. To be certified as an instructor in the ADHP, the sponsoring dentist must attend the ADHP IC Course and send the completed application and test found below with a check for $75 to the Board Office. Instructor Certification application for the incoming ADHP must be received by JUNE 15th. Notice of IC Course dates is emailed regularly. Please contact Ms. Hilda Johnson with questions regarding Instructor Certification requirements and IC Course dates. 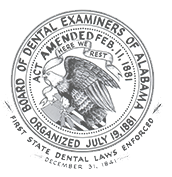 ADHP Students must complete the CITA dental hygiene clinical examination application available at www.citaexam.com in addition to the Alabama Dental Hygiene Program Licensure Application and Citizenship Verification. In order to be considered for licensure at the Board's July Meeting, your licensure application must be submitted no later than May 30th.